GRAND DETOUR – The voices of children will once again fill the hallways of the old Grand Detour Elementary School, as it soon becomes the new home for Faith Christian School’s elementary grades. Board members of Faith Assembly Church of Grand Detour signed closing papers Friday, Sept. 22 and acquired the building on behalf of Faith Christian School. School Superintendent Pastor Jon Marx isaid he s excited about the future. The acquisition of the Grand Detour School will provide much needed space for Faith’s elementary grades, which are currently housed in the annex of Faith Assembly Church. Not only has enrollment nearly doubled over the past 20 years, the school has also grown in the breadth of curriculum and programs offered to students and their families. In addition to its Fine Arts and sports programs, Faith School partners with online educator Sevenstar to offer advanced courses at the high school level. And in 2015 the school partnered with CLC of Grand Rapids, Mich., to implement AIMSweb Benchmark Testing and Intervention Block, which helps staff to accurately measure a child’s academic progress and then to apply differentiated instruction to meet each student’s individual needs. On Wednesday, Oct. 4t the school held a ceremony in celebration of the purchase of their new facility. Family and friends of Faith Christian School, along with media and the community were in attendance. The school expects holding classes by the Spring of 2018, following completion of improvements and renovations. Randy Ortgiesen attended the Grand Detour School growing up as a child. He is currently on the board of Faith Assembly Church, and his children all graduated fom Faith Christian School. Faith Christian School first opened its doors in 1980, and is a ministry of Faith Assembly Church of Grand Detour. In 1985, it built a 20,800 square foot facility which has become the main campus and houses its junior and senior high grades. 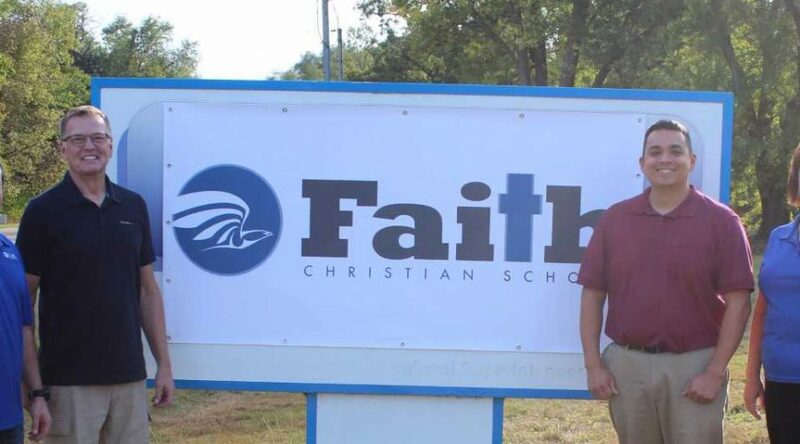 Through the years Faith Christian School has pursued excellence in education, as well as fostered an environment for spiritual growth in its students. For more information on how to become a part of this growing school community, contact Linda Foster, principal, Faith Christian School, 7571 S. Ridge Rd., Dixon, IL, 815-652-4806. Click here to view the original Ogle County Life article.